We have state-of-the-art robotic welding facilities available on site and offer a 24 hour service to deliver rapid turnaround times. 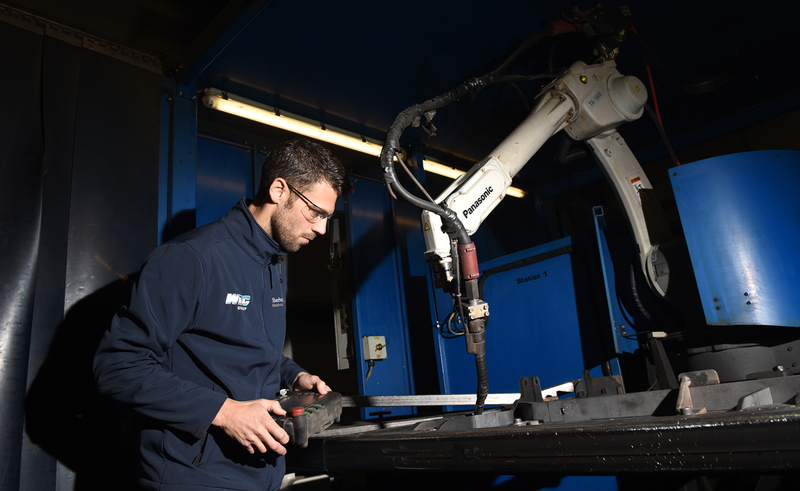 Over the past few years, we have made substantial investments in the latest robotic welding technology as a way of improving our efficiency and minimising costs for our expanding customer base. With a capability of 2.5m x 1m in 3D, combined with in-house design support using 3D CAD Design software, complete harmonic movement can be made with the jigs to manipulate weld seams to optimum angle. We can offer standard and pulse welding capabilities in mild steel and stainless steel, with up to 1m per minute fillet speed and a maximum assembly weight of 500Kg. With the capability to perform repeated operations for long periods of time, robotic welding offers consistent quality and repeatability. Particularly important for safety-critical parts, the automation provides customers with confidence that the quality of the welds will always be of the highest standards. As robotic welding cells can weld 3-5 times faster than manual welders, we are able to offer rapid turnaround times.